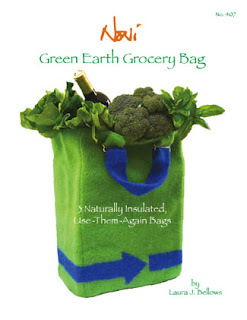 The Noni Green Earth Grocery Bag is a stylish alternative to other shopping bags or worse, the evil plastic bag. The handle hardware is felted right into this bag for extra strength. The Recycle It! Arrow is knit in intarsia on both sides of the bag. This is a simple intarsia design that is suitable for a beginner knitter. If you’d rather avoid intarsia, simply knit a continuous stripe around the bag. The edgy Whimsical Backpacks for Grownups and Kids. Spiney Beast is a bright blue monster and Grassy Hill is covered with grass and flowers. 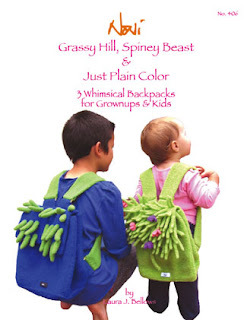 Or you could create your own fabulous backpack design. These bags are knit in one piece with flap embellishments and I-cord closures. 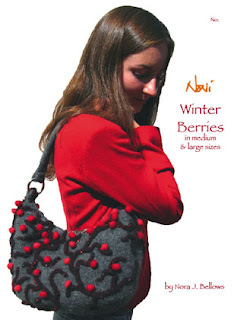 Winter Berries is a gorgeous yet practical bag that you’ll love to knit and wear. The bag is knit in one piece with a zipper closure. The I-cord branches and bobble berries are arranged and sewn on by hand. 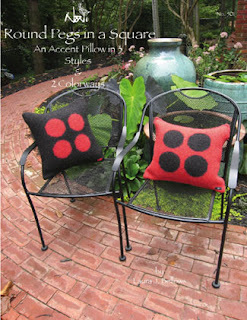 Liven up your home with these Round Pegs in a Square Accent Pillows. There are three construction options for these pillows. I’d opt for the Single Faced-Pillow with Felted Back, knit all in one piece with an opening for the zipper. This method requires the least finishing of the three options and is the one pictured on the pattern. These projects are knit with Cascade 220, a great felting yarn. Or try the Ella Rae Classic yarn, another fantastic felting yarn that’s already wound into balls. We have loads of colours of both. Check out the entire Noni collection. We regularly stock many of these patterns and we’re happy to make special orders. Knit a Noni and get your creative juices flowing! This entry was posted on Monday, November 26th, 2007 at 11:49 pm	and is filed under Uncategorized. You can follow any responses to this entry through the RSS 2.0 feed. Both comments and pings are currently closed.